The classic Hans Christian Andersen story retold with simple text for children just beginning to read. 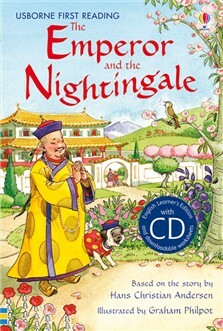 The nightingale sings so sweetly that everyone loves to hear her song. But when the Emperor of China receives a new dazzling mechanical songbird made from gold and rubies, he has eyes for nothing else. What will become of the little nightingale now? Colourfully illustrated by Graham Philpot. Available as ebook with narration in British English (only on tablets that support audio).